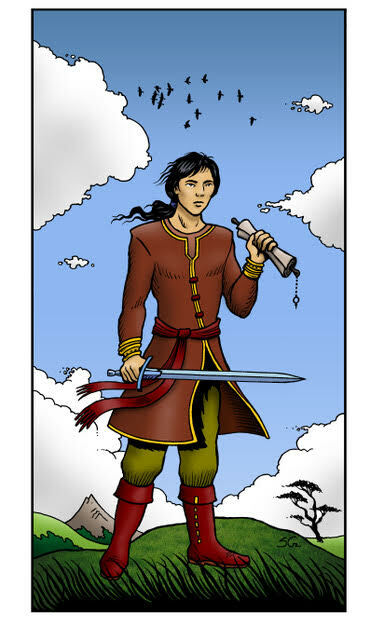 It’s the 28th week of the year and the card of the week is the Page of Swords. The Page of Swords represents the spark of an idea. Since there are so many Cups cards this week, these ideas must be fed with loving kindness in order to grow. There’s not really anything major happening in the sky this week so this is more of a week of processing than anything else. 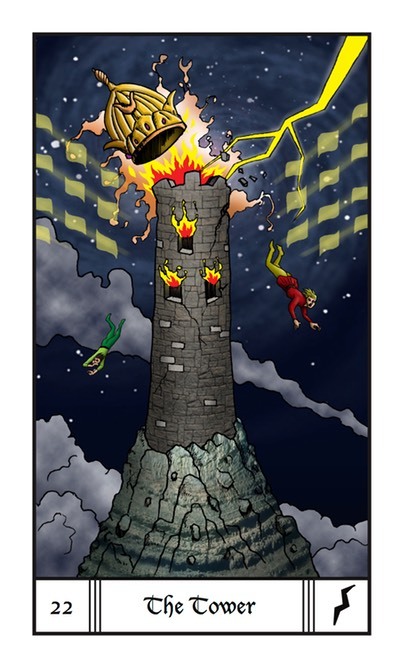 However, do be careful on Sunday with the appearance of the Tower card and several challenging squares. It’s the 28th week of the year which in astrology adds up to 1, reminding us that things are always changing. Mantra: A balance between mind and heart is a good place to start. 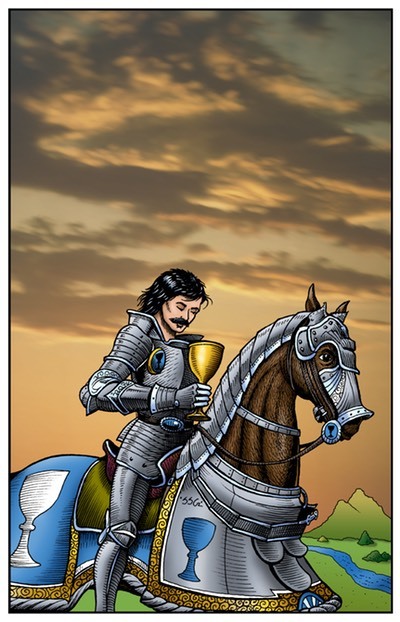 The Knight of Cups is a traditionally masculine card that indicates the appearance of a lover, not a fighter. He is on a journey of love and is in no rush to get to his destination. If he doesn’t represent you, he represents someone you may encounter today. Moon trine Venus at 11:03 AM PST is a sign of happiness, lover and beauty. But Moon opposition Mercury at 3:38 PM PST could bring in some heavier feelings as the inspiration of love from the morning turns into a conflict between head and heart. But this will give you the chance to explore the depths of your soul. The Moon is in the revolutionary sign of Aquarius all day, bringing revolutions in love. The number of the day is 9, a number of near completion. Mantra: The journey is shorter than you think. Enjoy it. 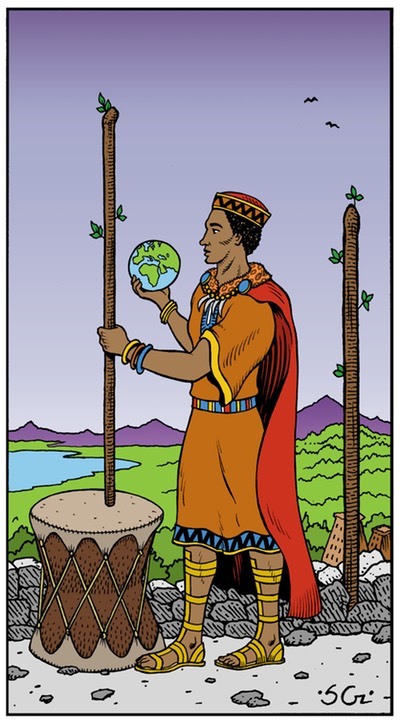 The 2 of Wands is a card of potential realized. What will you do with it? Moon trine Jupiter at 3:20 AM PST is a jolly, generous transit that will bring good feelings with it. Moon sextile Saturn at 6:46 PM PST will find you getting to work this evening as you do what you have to do with a sense of duty. The Moon is still in the revolutionary sign of Aquarius bringing more changes along with it. The number of the day is 1(0), a number of new beginnings. Mantra: I can do anything I set my mind to. 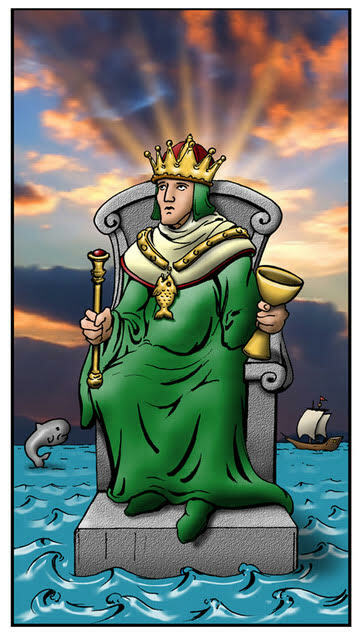 The King of Cups is a traditionally masculine card that indicates the appearance of a man that has total control over his mind, body and spirit. No matter what happens today, the King tells you to experience it with loving kindness. Moon sextile Uranus at 5:40 AM PST is the only exact transit today. This is a restless, exciting transit so you may feel like doing something out of the ordinary today. But whatever that is, do it with the intention of love in your heart. The Moon is still in Aquarius in the early hours of the morning. She goes void of course in Aquarius at 5:40 AM PST. While she is void of course, let things happen as they will. You may find the excitement you’re looking for in surrender. The Moon then enters the flowing sign of Pisces at 8:51 AM PST. Although it’s OK to push when the Moon isn’t void of course, Pisces advises to continue to float along to get the most out of the day. The number of the day is 2, a number of partnership and balance. Mantra: Let the love flow. 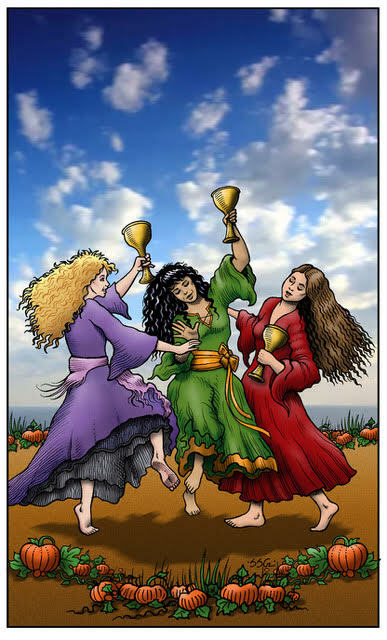 The 3 of Cups is a card of celebration. Make sure you take time today to celebrate the good things in life. Moon square Venus at 2:28 AM PST is a clingy, moody, lazy transit. Resist the urge to indulge. If this transit happens while you’re asleep, the themes may appear in your dreams. Moon sextile Pluto at 6:50 PM PST is a transit of deep feelings and emotions that could bring revelations in relationships. It also awakens a love of the mysterious. The Moon is still in the psychic sign of Pisces so open yourself up to experience the love of the Divine today. The number of the day is 3, a number of things coming together. 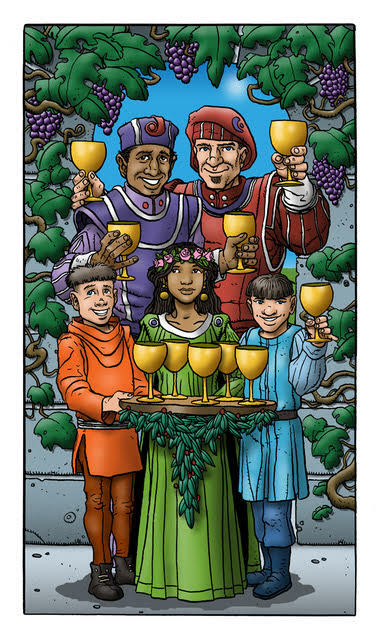 The 10 of Cups is one of the happiest and luckiest cards in the deck. It’s a card of endings becoming beginnings as one door closes and another one opens. Today you may be asked to look back on the journey you’re on and evaluate where you’ve been, where you are and where you’re going. Even if the journey hasn’t been easy, do this reflection with love in your heart. Moon trine Sun at 2:26 AM PST is a transit of happiness, harmony and flow. Moon square Saturn at 3:08 AM PST may bring depressing, negative thoughts. Approach your feelings as passing bad moods. If you are asleep during these transits, the themes may appear in your dreams. Moon trine Mars at 10:00 AM PST is a transit of leadership and bravery. If you’re called to step up, answer. Mercury sextile Jupiter at 1:46 PM PST is a transit of planning for the future as the big picture comes into focus. This transit may also indicate travel. The Moon begins the day in the intuative sign of Pieces and goes void of course between 10:00 AM PST and 4:52 PM PST when She enters the energetic sign of Aries. If you feel restless, make sure you do something physical to burn off the steam and bring yourself back into flow. The number of the day is 4, a number of stability. Mantra: Whatever you are be a good one. 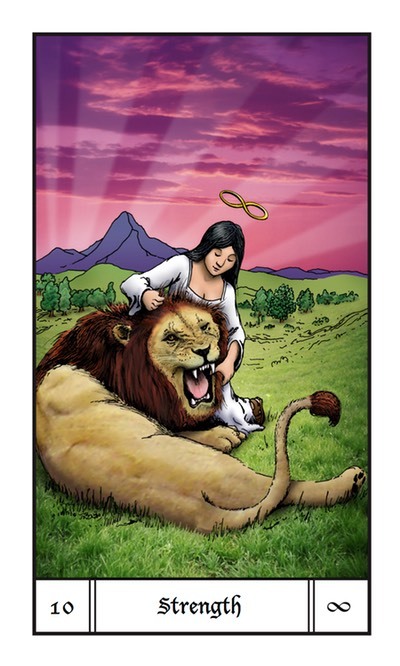 The Strength card is a card of opposites attract. The maiden and the lion are so different and yet they have a partnership that works. Be open to those who are different than you today. You may be pleasantly surprised at what comes from it. Moon sextile Venus at 2:40 PM PST is a transit that encourages you to be with people you care about. Moon opposition Jupiter at 8:03 PM PST is a card of spiritual doubts, laziness and overspending. Moon trine Mercury at 11:38 PM PST is a transit of flowing communication. If you’re up late you may find yourself having good conversations with family and friends well into the night. The Moon is still in the energetic sign of Aries so make sure you stay active today to get the most out of today. The number of the day is 5, a number of overcoming challenges. The Tower is a card of unexpected surprises and they’re not always good ones. Keep it low key today because the risk of being “struck by lightning” is great. Avoid risky behavior, heavy machinery and be careful with sharp objects or anything else that could potentially lead to an accident. Moon square Pluto at 1:06 AM PST is a compulsive, confrontational transit. Beware of people trying to manipulate you. Moon trine Saturn at 8:50 AM PST is a dutiful transit that allows you to accept things as they are. Moon square Sun at 12:26 PM PST is a transit of conflict as it brings the last quarter in Aries. Don’t fight what you can’t change. Instead, set your intentions to tackle these obstacles for New Moon. Moon square Mars at 6:12 PM PST is an angry sign of outbursts. If you feel irritable, go for a walk, run or do some other kind of exercise to exert and move that energy. Moon conjunct Uranus at 7:19 PM PST is an impulsive transit. Resist the urge to act out for the sake of stirring things up. The Moon is in the powerful sign of Aries today but too much fire may lead to burn out. The Moon is void of course between 7:19 PM PST and 10:04 PM PST when she enters Taurus, the sign of love and beauty. The number of the day is 6, a number of victory. Mantra: There are some things we can’t change. Magdalena Tarot does not claim the rights to any of the Tarot card images used here. All images are from the Evolutionary Tarot by Richard Hartnett, H.W., M.
This entry was posted in art, Astrology, dreams, Evolutionary Tarot, mysticism, mythology, Neptune Retrograde, numerology, occult, Pluto Retrograde, Saturn Retrograde, self help, spirituality, Tarot, witchy, Writing and tagged abundance, art, astrology, card a day, divination, dreams, empowerment, inspirational, magick, manifestation, mantra, meditation, metaphysical, motivational, mysticism, numerology, occult, pagan, predictions, psychic, qabalah, self empowerment, self help, spiritual, spirituality, tarot, tarot reading, tarot weekly forecast, wicca, witchcraft, witchy, writing. Bookmark the permalink.